What country-shape does your dream have? What’s the place you will go to tomorrow without hesitation, for which you’re hiding money under the mattress? Oh, everyone has one and sometimes not just one. It happens to have the shape of California and its palms, Thailand and its temples. Once we met a person whose dream was in the form of Bhutan and the Himalaya. Well, the problem of all these goals so desired, so imagined, it is the load of expectation that they carry! Willy-nilly you end up fantasizing so much and for so long that the risk of being disappointed is just around the corner. It can be due to everything! To a gloomy sky, the meeting with a rude person, a monument under restructuring, the impossibility of seeing a thing … the fact is that many expectations, potentially correspond to many disappointments. We have taken this risk with Iceland! Yes, because we have spent too much time organizing in detail a journey made of a thousand variables independent from our will. “We try, worst case scenario we will have nothing to regret!” We told each other. And among all our projects, two were those for which we prayed for nights and days, different gods, nature and even superheroes: the northern lights and the ice caves. Bam, both ruined by external factors! How it could be possible we don’t know, what we are sure of is that regardless of what we have not seen but we would have liked to see, expectations about Iceland were so high but not enough to be compared to reality. When a place is beautiful, but beautiful to die for (or to live for), like this island, there is nothing that can belittle it. Not even the impossibility of living two incredible experiences like the ones we had in mind. And even if we did not have enough time, it was enough to make us promise to come back! We will return more calmly, dear Iceland, and we will have the opportunity to get to know you more deeply, to learn more words than the simple “halló” and “takk”, cross our heart. For the moment it’s okay, it’s good to have seen and loved everything we could. We wanted to thank especially Goecco for giving us this opportunity: thank you for thinking about those like us who are eager to see and discover but that don’t have enough time to do it, thank you for taking care for everything and for allowing us to see so many places, thanks for the 800km travelled in 16 hours through the most characteristic spots in Iceland. 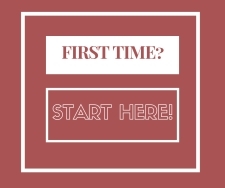 Well, let’s start from the beginning. When, how and why to do this tour? 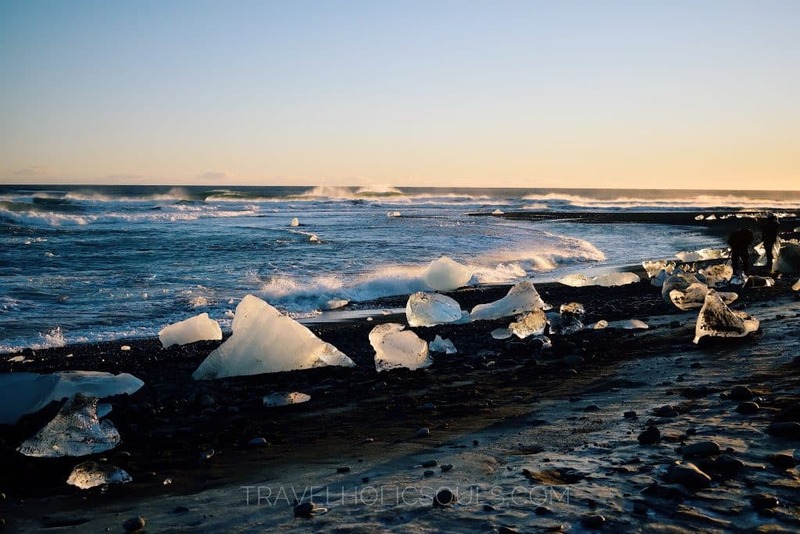 In Iceland travel is possible in two ways: organized tours or car rental. As we have already explained we have chosen the first option. We needed something that allowed us seeing as much as possible starting from / returning to Reykjavík, which did not last several days and that it gave us the chance to see the ice caves. Iceland Ice Cave Glacier Lagoon EXPRESS TOUR was the only tour able to satisfy all our requests. and despite all the pre-requisites listed above you want to see some of the island most iconic spots. Departure is obviously very early in the morning: at 7 o’clock in front of Hallgrimskirkja. However, you sleepers, have faith, for the first hour of travel you can continue to doze. The first stop, about a couple of hours from Reykjavik, it will be Skogafoss. Editor’s note: If you do this tour in winter the light hours will be still few but enough to let you admire one of the most beautiful waterfalls. 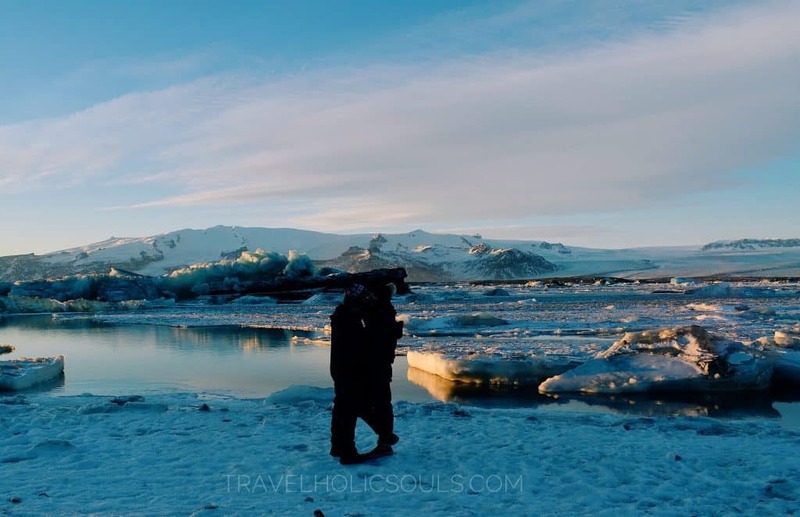 The guide, among the breaks, he will tell you about Iceland and its history, its curiosities and beliefs, its numbers … and he will do it with a big smile and he will make you laugh for sure. For example, did you know that a Justin Bieber’s music video was filmed here? Or that in proportion, there are less Icelanders who believe in trolls than Americans who believe that Elvis is still alive? 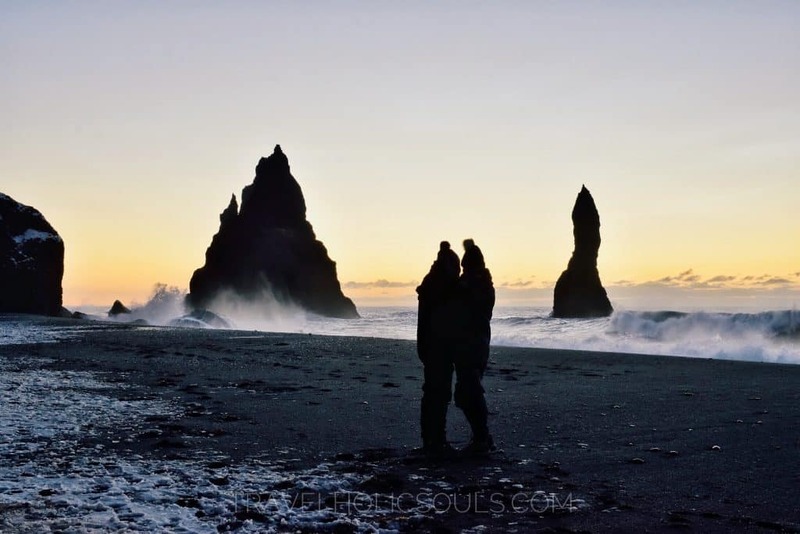 After about another hour you will be in Vik, a delightful fishing village and at the world-famous Reynisfjara beach. 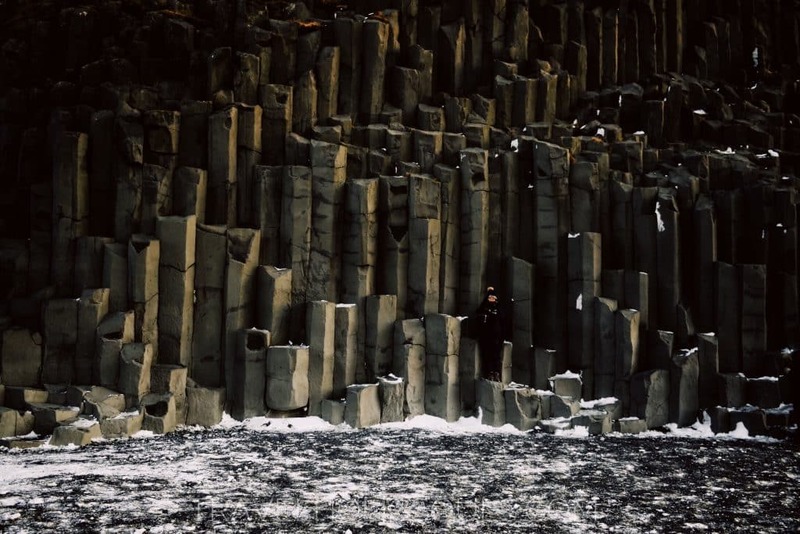 The image is this: a black expanse of sand and pebbles, the high and thundering waves of the sea, the white foam, the white snow, the dark basalt columns. Plus reserved for people who will do the tour in winter it is the arrival near dawn, so with a sky that will be unforgettable! Standing in front of a similar scene, we understood why we travel! Looking at places like this, a person understands what the world can give and how much time is wasted whithout discovering masterpieces like this. Life is measured in quality and not in quantity, let’s always remember it. With eyes still full of the last stop, a surreal view opened up before us. Ice diamonds on black velvet. Absurd. We have never seen anything more beautiful. Nature is a meticulous artist, it takes so long to create but then its works are simply pure perfection. Even bitter cold vanished with this sight. The memory of this place, of these glaciers crossed by the rays of the sun, of this sepia beach, it will be one of those that will keep us company when we will be old. The fourth stop, the last but not least, it is the Glacier Lagoon whose name in the native language is soooooo difficult. Jökulsárlón. 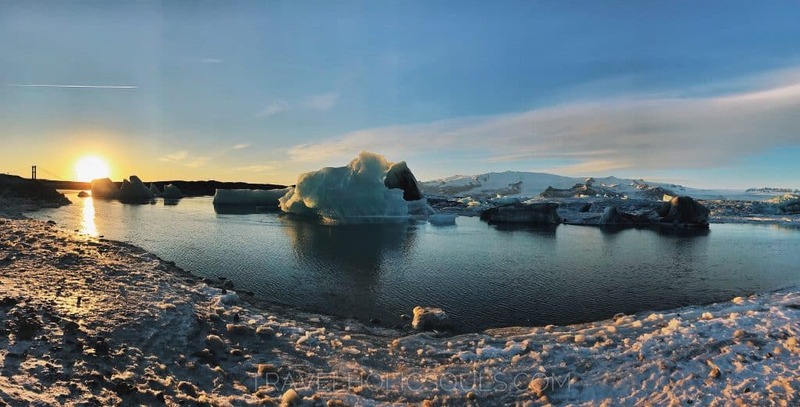 It is a glacial origin lagoon in which icebergs float. Can you imagine it? Blocks of ice come loose from the nearby Vatnajokull glacier, which go down to the lake and then to the sea. The feeling is like being in some National Geographic documentary. What was left to do after so much wonder were the ice caves (note: not to be confused with the icy caves). We are going to explain what they are: in the Vatnajokull glacier, which it is the largest glacier in Europe, there are a series of caves caused by the flow of water through or under the glacier or due to the geothermal heat of the volcanoes. These caves, which they can be of different sizes and shapes, they can be visited almost exclusively during winter, when cold preserves the ice better. It goes without saying that the visit to places like these, disarming beautiful but so dangerous, they cannot and should not be visited without the supervision of an expert guide. There was a wonderful weather up to 5 minutes before we arrived at the opening of the caves … then it began to blow so badly. Never seen such a wind! It had the strength to push people away. They informed us that in just an hour the entrance would no longer be accessible so once inside we would not be able to get out. Well, we came away. Evidently it was not in our destiny. However, even this is the beauty of Iceland, the strength of the unstoppable Nature. Are we sorry? To death. Do we have regrets? No, we don’t. Was it worth it? No doubt. The return to the city has been quiet and calm. A couple of stops for toilet and a stop for the waterfall Seljalandsfoss whose luck is to be lit by spotlights and therefore visible even at night. There are no words to describe the beauty of certain places. Sometimes you just have to keep quiet and to insist in order to push people to live certain experiences firsthand. So, we insist, take the first flight to Iceland, steal a few days from the routine and book this tour. 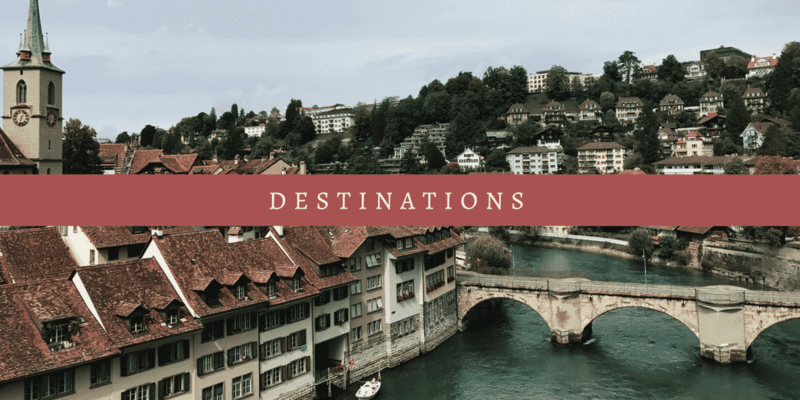 The money spent on traveling is never spent poorly! Warm clothes. Because it’s cold. Above all, close to the sea, the feeling is that the wind is cutting your hands. Layers. Because it’s cold outside but it’s hot in the bus. Be careful! Take proper socks, thermalshirt and pants. It’s an express tour. There are few extra breaks but they are mainly related to physical needs and light meals. Bring snacks and sandwiches with you. You will thank us! Our bus had also a single plug near the driver; bring a powerful power bank to keep your technological devices alive, we want to remind you that the cold drains the batteries. A sense of amazement seeing places that you don’t believe they can really exist. 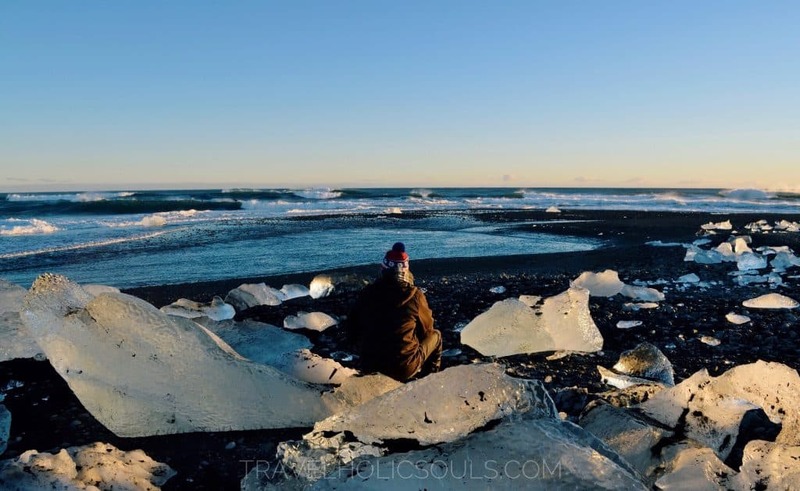 Because the world is there, before the eyes and it’s big, immense: it looks at you from the waves of Diamond Beach, from the cliffs in Reynisfjara beach, from the glacier Lagoon icebergs … and you can not help but feel small and insignificant. And though it may seem absurd, it’s a wonderful feeling. You feel in the right place at the right time, perfectly at peace with your senses. The need to hug your beloved one with your arms to get warm, losing yourself in the horizon, the cyclic noise of the sea. Because despite the extreme weather there are fish and seals and birds. Because despite the cold and the wind people come from all over the world. Because in places like these, the hearts of all living beings beat at the same pace: bumbum, bumbum, bumbum. For a magic like this, it’s worth traveling. For a magic like this, it’s worth living. I have also bad luck with the Northern Lights, but with me it was in Norway!! I Loved Norway! 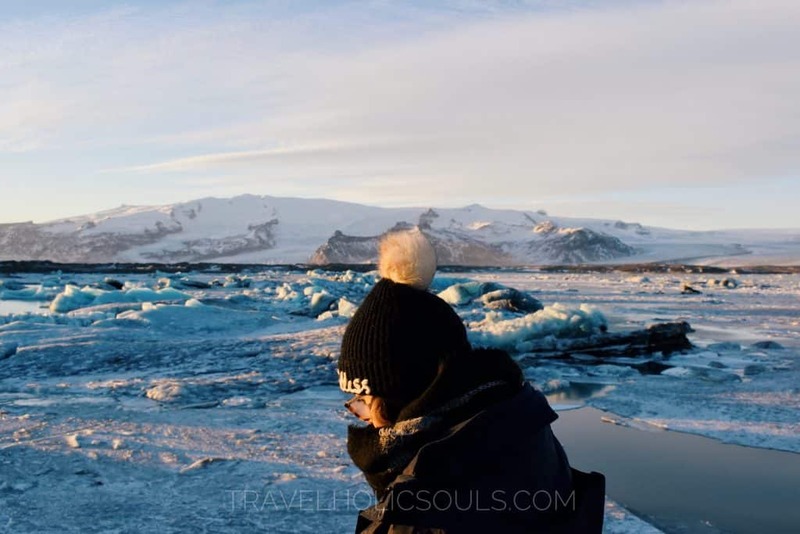 Iceland it is on top of my list and I get so jealous reading and looking at your pictures, how beautiful it is there!! Zineb (24) and Simone (28), exploring the world a weekend at a time. We are that kind of a couple who prefers a handful of memories instead of everything else. We are a couple who used to come back home after a journey more in love of life, of the world, of ourselves. 🌟 Yosemite park in just 1 day: is it possible? 🌟 Is it Blue lagoo worth a visit? Find out!